“WHAT if we could just be China for a day?” mused Thomas Friedman, an American columnist, in 2010. “…We could actually, you know, authorise the right solutions.” Five years on, few are so ready to sing the praises of China’s technocrats. Global markets have fallen by 7.1% since January 1st, their worst start to the year since at least 1970. A large part of the problem is China’s management of its economy. For well over a decade, China has been the engine of global growth. But the blistering pace of economic expansion has slowed. The stockmarket has been in turmoil, again. Although share prices in China matter little to the real economy, seesawing stocks feed fears among investors that the Communist Party does not have the wisdom to manage the move from Mao to market. The rest of the world looks at the debts and growing labour unrest inside China, and it shudders. Nowhere are those worries more apparent—or more consequential—than in the handling of its currency, the yuan. China’s economy is not on the verge of collapse. Next week the government will announce last year’s rate of economic growth. It is likely to be close to 7%. That figure may be an overestimate, but it is not entirely divorced from reality. Nevertheless, demand is slowing, inflation is uncomfortably low and debts are rising. The bullish case for China depends partly upon the belief that the government can always lean against the slowdown by stimulating consumption and investment with looser monetary policy—just as in any normal economy. Yet China is not normal. It is caught in a dangerous no-man’s-land between the market and state control. And the yuan is the prime example of what a perilous place this is. After a series of mini-steps towards liberalisation, China has a semi-fixed currency and semi-porous capital controls. Partly because a stronger dollar has been dragging up the yuan, the People’s Bank of China (PBOC) has tried to abandon its loose peg against the greenback since August; but it is still targeting a basket of currencies. A gradual loosening of capital controls means savers have plenty of ways to get their money out. A weakening economy, a quasi-fixed exchange rate and more porous capital controls are a volatile combination. Looser monetary policy would boost demand. But it would also weaken the currency; and that prospect is already prompting savers to shovel their money offshore. In the last six months of 2015 capital left China at an annualised rate of about $1 trillion. The persistent gap between the official value of the yuan and its price in offshore markets suggests investors expect the government to allow the currency to fall even further in future. And, despite a record trade surplus of $595 billion in 2015, there are good reasons for it to do so, at least against the dollar, which is still being propelled upwards by tighter monetary policy in America. The problem is that the expectation of depreciation risks becoming a self-fulfilling loss of confidence. That is a risk even for a country with foreign-exchange reserves of more than $3 trillion. A sharply weaker currency is also a threat to China’s companies, which have taken on $10 trillion of debt in the past eight years, roughly a tenth of it in dollars. Either those companies will fail, or China’s state-owned banks will allow them to limp on. Neither is good for growth. The government has reacted by trying to rig markets. The PBOC has squeezed the fledgling offshore market in Hong Kong by buying up yuan so zealously that the overnight interest rate spiked on January 12th at 67%. Likewise, in the stockmarket it has instructed the “national team” of state funds to stick to the policy of buying and holding shares. Yet such measures do nothing to resolve a fundamental tension. On the one hand, the state understands that the lack of financial options for Chinese savers is unpopular, wasteful and bad for the economy. On the other, it is threatened by the ructions that liberalisation creates. For Xi Jinping, the president, now in his fourth year in charge, that dilemma seems to crop up time and again. He needs middle-class support, but feels threatened by the capacity of the middle class to make trouble. He wants state-owned enterprises to become more efficient, but also for them to give jobs to the soldiers he is booting out of the People’s Liberation Army. He wants to “cage power” by strengthening the rule of law and by invoking the constitution, yet he is overseeing a vicious clampdown on dissent and free speech. It is easy to say so now, but China should have cleaned up its financial system and freed its exchange rate when money was still flowing in. Now that the economy is slowing, debt has piled up and the dollar is strong, it has no painless way out. A sharp devaluation would wrong-foot speculators. But it would also cause mayhem in China and export its deflationary pressures. The poison would spread across Asia and into rich countries. And because interest rates are low and many governments indebted, the world is ill-equipped to cope. Better would be for China to strengthen capital controls temporarily and at the same time to stop stage-managing the yuan’s value. That would be a loss of face for China, because the IMF only recently marked the yuan’s progress towards convertibility by including it in the basket of currencies that make up its Special Drawing Rights. But it would let the country prepare its financial institutions for currency volatility, not least by starting to scrub their balance-sheets, before flinging their doors open to destabilising flows. Mr Xi could embrace more complete convertibility later, when they were less vulnerable. One reason the PBOC is rushing towards convertibility, despite the risks, is that it feels that it must seize the chance while it has Mr Xi’s blessing. But better to retreat temporarily on one front than to trigger a global panic. That might also lead to some clearer thinking. There is a contradiction between liberalisation and party control, between giving markets their say and silencing them when their message is unwelcome. When the time is right, China’s leaders must choose the markets. 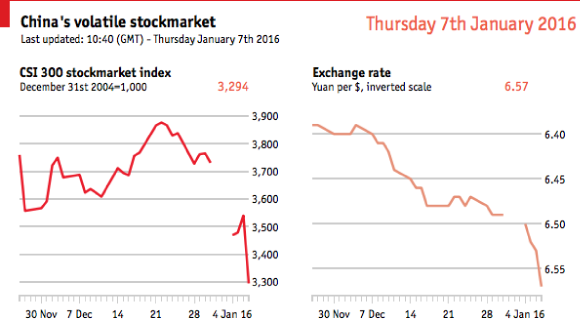 The Chinese stock market fell dramatically last week. That sounds significant but it actually isn’t. First, the Chinese stock market doesn’t serve the same function as Western markets. The equities that are sold there do not allow shareholders to control companies, nor are the underlying values of these companies correlated to the price of the stocks in any way. Second, the percentage of China’s wealth that flows through the markets is relatively small compared to the size of China’s economy. Market capitalization has little to do with value of Chinese companies. The really significant news last week related to China’s foreign reserves. The People’s Bank of China revealed on Jan. 7 that the country ended 2015 with less foreign reserves than it started the year with. It was the first time reserves shrank over the course of a year since 1992. In effect, China saw its first decline in reserves since the Chinese boom really got under way. The surprising part of this development is not the contraction, since that’s been going on for at least a year, but the fact that it was announced. And this announcement told us that China entered a new era in 2015 and is now in uncharted waters. There are more important implications stemming from the decline in reserves than the Chinese stock market’s panic. The government’s anxiety was shown by aggressive assertions of confidence, demands for greater discipline, and an intensification of arrests of Chinese officials, businessmen, and others. The government is worried and is clamping down. Indeed, it has been worried for several years, and President Xi Jinping has been trying to maintain social stability in the face of a sea change in China’s economy. Now, as he attempts to reform—and control—the People’s Liberation Army, which is the key to China’s regime, we are in the witching hour in China. Whether the regime can maintain stability in the country while it undergoes managed change is at issue. I wrote last week about China’s reality and strategy in anticipation of this sort of crisis. The task this week is to step back and take a look at the global reality. China is not the only nation in Eurasia facing social and political instability as a result of economic shifts. Almost all of Asia, with the major exception of India, is undergoing growing instability of different sorts. The Europeans are struggling to deal with massive economic and political divergences within the European Union. The Russians are simultaneously attempting to deal with an economic crisis stemming from declining oil prices, but rooted in their inability to use oil revenues to build a more robust economy. The Middle East is in political and military chaos, due to reasons ranging from US attempts at disengaging from the region to deep animosity between Shiite and Sunni Muslims. And Central Asian countries, caught between Russian and Chinese dysfunction and the lapping waters of M uslim discontent, are struggling to contain the resulting unrest. What we are seeing is a region—from the Atlantic to the Pacific, and from the Arctic to the Indian Oceans—destabilizing. Of the 7 billion souls alive today, 5 billion live in this region. In most of Eurasia, the realities that have been taken for granted for the past generation are no longer certain. There has been a belief in much of the region that, at some point, everything will go back to normal. It was assumed that China’s economy would flourish; that Europe would sort out its problems; that, without the US presence, conflicts in the Middle East would subside; and that Russia would, in due course, accommodate itself to its new liberal democratic principles. However, none of those things are going to happen. Instability, uncertainty, and increasingly impotent regimes trying to find their way out of the crises they have stumbled into, are the new normal. The different parts of Eurasia will not experience the same type of crisis. China’s problems are not the Middle East’s, and the Middle East’s are not Europe’s, but these regional crises have a common cause and interact with each other, complicating them enormously. I wrote a recent article for Mauldin Economics about an emerging crisis for major exporting countries. I want to expand on this in order that we might understand the root cause of the Eurasian crisis—interdependence. Interdependence has been seen as a panacea for humanity’s problems. However, it solves problems, but also creates them. Its most important weakness is that a systemic failure in one region rapidly spreads to other regions. The attempts to solve problems in some nations also affect other countries. Therefore, a byproduct of an interdependent system actually turns into the most dangerous reality of all. This byproduct is conflict among nations, as they str uggle to stabilize their own crises and are constrained by the behavior of other countries. The conflicts brought on by interdependence are the most dangerous because they breed the greatest desperation. The current Eurasian crisis began in 2008, a crisis that resulted in recessions that had a global impact. The United States and Europe reduced the amount they imported from around the world. China was in a particularly vulnerable position because its economy was heavily dependent on exports. It had been expanding dramatically for over a generation and, as ought to have been obvious, such an expansion was not eternally sustainable. By 2008, China was reaching the limits of its economic model. But as many do, China sought to extend the model, not so much out of greed, as out of fear of what slow growth might mean socially, in an extremely poor country. The Chinese sought to sustain the economy through various forms of subsidies that continued to support growth in GDP—although not at the same level as before—but pyramided the growing irrationalities of the economy. It was cushioned by its financial reserves, but that could last only so long. China’s economy has continued to slow. The last update from China’s official statistics agency reported 6.9 percent growth in the third quarter of 2015. I suspect, although can’t prove, that the real growth rate is substantially less than what Beijing claims. And to the extent that the growth was real, it was likely not very profitable. China has many competitors who sell the same products at a lower price. Because of this slowing growth, the amount of industrial commodities China could buy, from iron ore to oil, declined. As always, there was a failure of the markets to grasp that the Chinese economy was not going to return to the old normal, but that a new normal had been in place for several years and, therefore, the price of these commodities was irrationally high. The inability of markets to see what was obvious was critical over the past two years or so. But this is a normal feature of financial markets, which have a great deal of trouble identifying discontinuities. It is the true irrationality of markets, but a dangerous one to try to exploit. The market’s ability to delude itself collectively for extended periods of time is part of one of the fundamental realities of geopolitics: the interaction between economics, politics, and war, which is the place we all live our lives. And certainly where Eurasia is now. The illusion of China, which I once called the China Bubble, burst in 2014. I should emphasize that this was not the result of China’s economic shift. That had been going on for years. Rather, 2014 was when the markets realized that China’s downturn was now a permanent feature of the international system. Interestingly, the positive effects of lower oil prices on consumers were not trivial, but not nearly as significant as they would have been 30 years ago. Efficiencies and alternatives had decreased the importance of oil to consumers. But they did not decrease oil’s importance to producers. And, as important as the economic consequences of declining profits for mineral producers (it’s important to go beyond oil) have been, their political consequences have been critical. Last week, the son of the Saudi king said that Saudi Arabia was interested in selling part of the state-owned oil firm Saudi Aramco. The only reason to put this on the table is that the Saudis need money badly. The potential political consequences of the sale of Aramco are enormous. For decades before the 1970s, European and American interests had owned most of the region’s oil. This had been a sore point in the region; however, the Saudis and others changed this dynamic following the 1973 oil embargo. Nevertheless, the hostility toward the West in the Arab world has increased and, more importantly, the two groups are fighting a war in the region. For the Saudis, at any moment… but particularly at this moment, to raise the possibility of selling part of Saudi Arabia’s oil resources (however small the amount) back to Western interests, represents the deep crisis that falling oil prices have created. A similar problem exists for Russia. The Russians fumbled the Ukrainian crisis. They went from having a light but real control of all of Ukraine, to seeing the country governed by a pro-Western government, while Russia clings to Crimea and a small strip of support in the east. They were in the middle of confronting the West on this issue when the oil crisis hit. Oil revenues were a major component of Russia’s national budget and the driver of the economy. Their dramatic contraction led to a significant financial and economic crisis for which the Russians have no solution. There are many reasons for why they became more assertive in their foreign policy, but maintaining domestic confidence in the government is the key. The decline of oil prices and its impact on the economy will remind most Russians of the events prior to the fall of the Soviet Union. By appearing to be a major player in Syria (Russia actually has deployed relatively few aircraft and fewer t roops), the government has maintained its popularity in spite of the emerging hardships. The point here is that not only is Eurasia as a whole in crisis, but the crises in individual countries and regions are increasingly interacting. The Middle East crisis is interacting with Russia. It is also interacting with Europe, both in terms of the refugee crisis and European deployments in the Middle East. The refugee crisis—where an extra million people on a continent of about 700 million people is hardly overwhelming—has revealed deep fault lines within Europe over the question of borders. Borders are the single central issue of the European Union, and it was thought to have been settled. In addition, Europe’s ongoing inability to solve its economic malaise—and I don’t expect a solution for a long time—has intensified China’s problems. Europe was China’s largest customer. Also, the crisis in Ukraine has focused Poland and Romania on the perceived threat from the east, much to the indifference of the rest of Europe, but drawing in the United States as the guarantor of the eastern frontiers. And as mentioned, our forecasting model at Geopolitical Futures points to serious instability in Central Asia as a result of Russian, Chinese, and Middle Eastern problems. Trade is another potential source of disruption brought on by interdependence. Exports constitute about 23 percent of China’s GDP. They make up almost 50 percent of Germany’s GDP and 30 percent of Russia’s. In Saudi Arabia, it’s 52 percent. However, in Japan it’s 16 percent. And, in the United States, exports are only 13.5 percent of GDP and only about 8 percent is attributed to countries outside of NAFTA. When we look at the export levels, we are measuring a nation’s vulnerability to the international system. I would draw the boundary of excessive dependence on exports at about 20 percent of GDP. It is important to add that I evaluate the consequences of dependence, not so much in economic terms, but in their impact on social and political stability. High exporters are not necessarily unstable, but their risk is higher. Based on this, and looking only at a handful of major powers, we can see one—though not all—of the drivers of the crisis in Eurasia. We can also see why Japan, as economically hard-pressed as it may be, has not destabilized. In looking at the American numbers, and at the geography of its exports, it is also evident why the United States, which may have triggered 2008, has generally not suffered much of the social chaos. It is least exposed to what happens in Eurasia because it depends least on those markets. There are other reasons, of course, but it is important to bear these export numbers in mind. 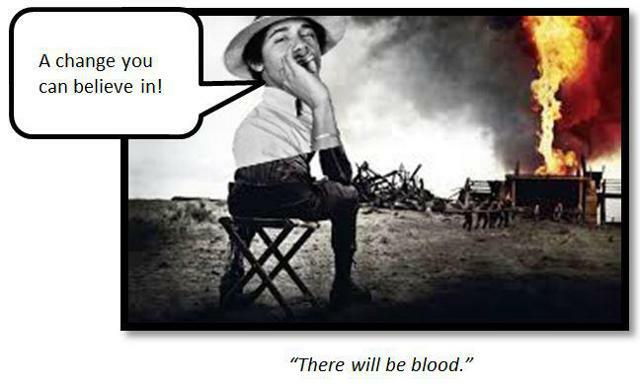 George Soros said this week that we are heading for a crisis similar to 2008. I disagree with him to this extent. First, the 2008 crisis never ended. It just merged with political, social, and military processes and became part of them. Second, the economic crisis, while there may be one, is trivial compared to the conflicts within Europe and along the European-Russian borders. It is trivial compared to the chaos in the Middle East and the economic dysfunction in China. Ultimately, the 2008 crisis never ended. Indeed, it defines the new Eurasia, a place where most human beings live, where stability is increasingly hard to find. Wall Street banks are poised to unveil another batch of lacklustre profits after the run-up to the Federal Reserve’s historic interest rate rise failed to boost their crucial trading businesses. Results to be presented over the next week and a half are expected to show the big five US investment banks generated even less revenue from trading in the last three months of the year than in the troublesome third quarter. The latest set of weak figures underlines how structural challenges — such as the Volcker ban on proprietary trading and a shift toward electronic platforms — are weighing on investment banks. In total, the big five — JPMorgan Chase, Goldman Sachs, Morgan Stanley, Bank of America and Citigroup — produced $8bn of revenues from their core debt sales and trading businesses in the quarter, Credit Suisse estimates. This represents a mere 2 per cent improvement from an especially tough period a year ago, and a 15 per cent drop from the previous quarter. The end of the year is a traditionally quieter time as investors wind down ahead of the festive break. Yet Brennan Hawken, analyst at UBS, said the fourth quarter was weaker than normal. Nervous investors sat on their hands as the persistently weak oil price combined with mounting fears over China, he said. Jitters had continued into the new year, Mr Hawken added, exacerbated by political tensions in Saudi Arabia and North Korea. “This type of environment is really, really bad,” he said. The corporate deal-making boom helped relieve some of the pressure. But M&A fees were equivalent to just one-tenth of those from sales and trading at nine top investment banks over the first nine months of the year. JPMorgan is expected to set the tone when it kicks off the results season this week with a forecast 16 per cent quarter-on-quarter decline at its fixed-income, currencies and commodities operation, according to Deutsche Bank. Together, analysts have forecast a 5 per cent drop in adjusted net income across the bank from a year ago to $4.86bn. Several executives, including Bank of America chief Brian Moynihan, last month issued downbeat predictions of fourth-quarter trading revenue. The Fed’s rate increase came just two weeks before the end of the quarter, limiting its positive impact on the financial results. Morgan Stanley set out plans last month to cut 470 employees from its FICC unit — equivalent to about one-quarter of its headcount. Banks’ retail arms are poised to benefit from the Fed’s interest rate rise. Lenders have already passed on higher rates to borrowers but have so far mostly held off from offering better terms to depositors. Goldman Sachs has calculated that banks could boost net profits by about 2 per cent this year, assuming a constant cost of deposits and two further rate increases from the Fed. Ken Usdin, analyst at Jefferies, said the big question for 2016 was whether losses from energy and other “over-leveraged” sectors were fully offset by gains from net interest margins. “If not, there will be even greater challenges for banks,” he said. - As the economic normalization begins, the final analysis of QE is reading more like an obituary. - Janet Yellen has been able to create FOMC unanimity in the absence of consensus - no mean feat. - As the American economy seems to be out of the woods, the Bank for International Settlements debunks the QE myth. - The FOMC signals it intends to deflate alleged global asset prices bubbles during the normalization process. - Judging the correct economic outcome of the collapse in oil prices is a key decision for the FOMC in 2016. As the line is drawn under the Fed's QE process, the narrative switches to framing its legacy for posterity. Several winners and losers are now being suggested. Ironically, QE itself is being presented as the biggest loser. Janet Yellen's most notable success of 2015, was in convincing her FOMC colleagues to trust her judgment in timing the start of the normalization process and its rollout going forward. The economic data has given support to both the Hawks and the Doves, so Yellen has done a great job in keeping them all within her broad church on monetary policy. This suggests that she will be given greater room for manoeuvre; and will also be able to make a few mistakes along the way since her standing with her colleagues is so high. Yellen has a working mandate in 2016. The release of the last FOMC minutes showed just how much respect and credibility Yellen has with her colleagues. Considerable concern about the continued failure to hit the official inflation target was evident. The interest rate increase was by no means a slam-dunk decision, with significant dissent around the table. The conflicting economic data easily justified staying on hold. 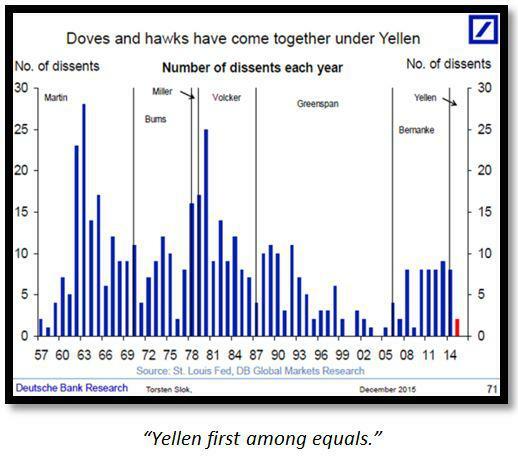 Yellen was able to get unanimity despite the evident lack of consensus. Both Hawks and Doves now trust her to do the right thing by the incoming data and state of the global economy. If Angela Merkel was Time's person of the year in 2015, Yellen just missed out; and could be there or thereabouts if she pulls off this remarkable balancing act throughout the year. Yellen must have breathed a huge sigh of relief, at the December Employment Situation report, assuming that she had not seen it already. The healthy numbers and some positive framing by Jon Hilsenrath is all that is needed to convince those with short attention spans, who also like to drive by looking in the rear-view mirror, that the US economy is out of the woods. Yellen's credentials and aura reached new highs as the numbers crossed the tape. The halo effect surrounding Yellen compares even more favourably, when viewed in contrast with that of her peers at the Bank of England, ECB, BOJ and PBoC. As Yellen seems to continue to make the right calls, her global peer group seem as equally prone to making the wrong calls. For now, she can do no wrong. Now that the US economy is allegedly out of the woods in global pole position and the US Dollar remains supreme as the world's reserve currency, the Bank for International Settlements (BIS) has summoned up the courage to deal the final blow to QE. In a recent report, the BIS destroyed the credibility of Ben Bernanke and his QE thesis. According to the BIS, the twin assumptions of a global savings glut and secular stagnation that support the QE thesis are bogus. America rebounded from the Credit Crunch, more than its peers, because it was the first and most aggressive to embrace its bad debt liquidation process. As the Fed normalizes, it can therefore look on with some satisfaction as the ECB and ultimately the PBoC go through the creative destruction phase. The Fed can also temper its enthusiasm for normalization, based on the global headwinds blowing in from the creative destruction phase. The normalization process is expected to be gradual and punctuated with periods of reflection; and analysis of the steps taken to date and their impacts going forward. Stanley Fischer was the first Fed speaker on deck in 2016; and gave a hint at just how protracted and gradual the process is going to be going forward. Even the title of his speech, "Monetary Policy, Financial Stability, and the Zero Lower Bound," suggested that the process of moving away from the current Zero Bound status quo will be almost imperceptible. He chose to address the normalization through rhetoric, by positing three questions. In answer to the question "Are We Moving Toward a World With a Permanently Lower Long-Run Equilibrium Real Interest Rate?" he implied that, under the current macroeconomic conditions, the answer is most likely yes. Cryptically, he qualified his final answer, by saying that much depended on the trajectory of fiscal policy. The door is therefore open for a fiscal expansion in the next Presidential cycle. He then moved on to address the direct criticism of the QE, which states that it creates disincentives for investment and consumption. This came under the rhetorical question "What Steps Can Be Taken to Mitigate the Constraints Associated with the ZLB?" Various suggestions have been made to mitigate these consequences; such as raising the inflation target, raising the equilibrium rate of interest, using negative interest rates and doing away with physical currency. Fischer discounted all the mitigation suggestions at the current time; but said that they are all worthy of further investigation. Finally, he addressed the issue of the Fed's intentions and capabilities to sustain a tightening in both monetary and financial stability policy, with the rhetorical question of "How Should Central Banks Incorporate Financial Stability Considerations in the Conduct of Monetary Policy?" His answer was clear. Since in his opinion the Fed does not have the panoply of financial stability tools that its global brethren have, it will reserve the discretionary right to use monetary policy as the ultimate financial stability tool. What can be gleaned from Fischer's exegesis reflects the practical teachings of the Saltwater School of economics that he imbibed and poured at MIT. The Fed is going to play the limited number of policy cards that it has got sequentially. These cards are interest rates and financial stability rules. It will only use interest rates as the ultimate weapon to counteract any financial bubbles if the financial stability cards do not win the round. Coming after Fischer, Cleveland Fed President Loretta Mester and San Francisco Fed President John Williams both sounded optimistic notes, that stronger growth in 2016 will hit the required KPIs for interest rate increases. There was, however, nothing overly optimistic in their comments, thus underlining Fischer's prosaic projection for the FOMC's gradualist behaviour going forward. Mester's insistence that the collapse in Chinese equities, which triggered a global rout, would not cause the FOMC to deviate from its normalization process was very enlightening. Mester's Hawkish tone was exacerbated by IMF chief economist Maurice Obstfeld's observation that the Chinese economic slowdown was going to create further falls in global equities. 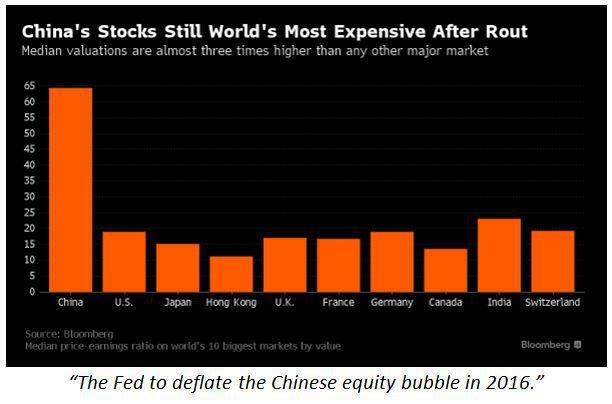 Put into the context of Fischer's speech, about bubbles and monetary policy, one could infer that the Fed is deflating a Chinese equity bubble (and possibly a global equity bubble) with the ultimate policy tool of interest rates. Ever cautious, Stanley Fischer felt it necessary to qualify Mester's comments, within the context of his previous remarks on interest rates and financial stability. In his reframing of Mester's comments, Fischer opined that the markets' assumption of four rate hikes for 2016 was "in the ballpark." He then signalled that the fallout, from the current turmoil in China, made the path of interest rate increases more unpredictable. He therefore confirmed that the FOMC intends to stick to its guns, with four rate hikes, at this point time. The process of deflation of the Chinese equity bubble and the global impacts of this will, however, influence the decisions about future rate increases and their timing. To underline the aforementioned skill of Janet Yellen in creating unanimity in the absence of true consensus, the Hawk Jeffrey Lacker then agreed with Fischer's ballpark estimate of four more interest rate increases in 2016. Lacker went even further to join the "unanimous," when he said that his prediction is conditional upon there being no external shock to the US economy. Lacker thereby obliquely referred to the global headwinds that are creating blowback into Fischer's explanation of interest rates and financial stability. Caution has never been something that Richard Fisher has been known for, either as President of the Dallas Fed or in his retirement. Free from the shackles of the Fed, he felt free to give his own commentary. According to him, the Fed has no tools available for further accommodation. China and the global economy will just have to suffer. Even more worryingly, he reported that the Fed had deliberately boosted asset prices with QE, immediately after the Credit Crunch. The inference is that there is an ugly correction in store for equity markets to "normalize" their bubble valuations. The last report examined the emerging geopolitical headache for the Fed, in relation to the disintegrating situation in the Gulf and its impact on oil prices. Falling in oil prices could be a disinflationary headwind or a tailwind, depending on how one looks at it. The war of attrition between Saudi Arabia and Iran hardened further, after the execution of the Shi'ite cleric Nimr Al-Nimr. 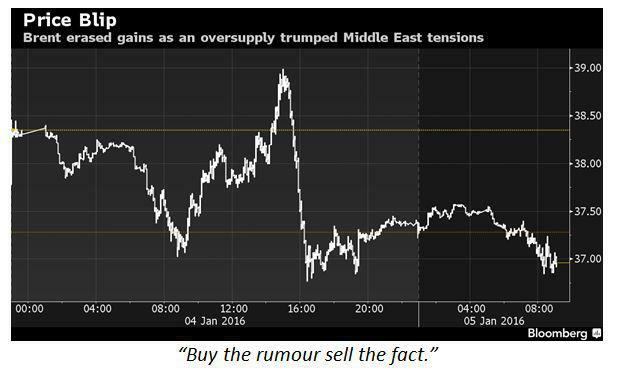 The uncertainty initially triggered a rise in oil prices. The Fed should be happy with this; since it, in theory, creates the inflation trigger that will help the Fed hit its inflation target. Looking through the knee-jerk reaction in oil prices, however, a war of attrition implies that both combatants will go after each other by expanding production and driving the price lower. Far from being a casualty in this war of attrition, the US shale industry has just become a major combatant. The first cargo of US shale oil set sail for the international markets on New Year's Eve, marking the end of 45 years of absence. The commonly held view is that US shale is uneconomical to produce at current spot prices; and also that the steep decline curves in shale well production is just about to kick in. 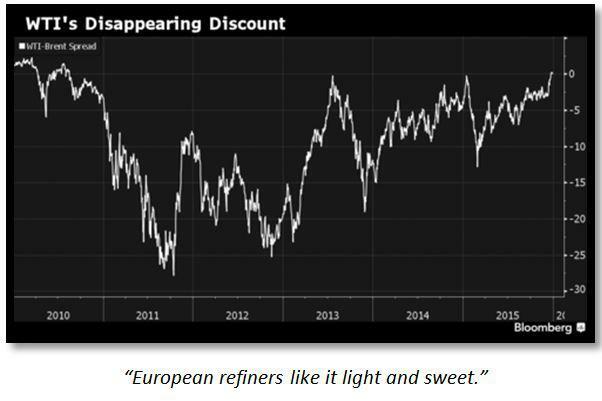 The US shale oil being exported is also "light" and "sweet" enough to command a premium in Europe, because it can then be blended with other grades to add value to them. As new global environmental fuel standards vitiate against "heavy" and "sour" grades, the future for US shale looks bright. Global demand for US shale is therefore strong. US shale drillers have also got substantial debts to pay off, so they must therefore continue to remain full-on until bankruptcy and or well declines occur. The recent issue of more shares by Pioneer Natural Resources Co. (NYSE:PXD) shows that there are at least still parts of Texas where oil drilling is economical at these prices. There is also the phenomenon known as the "fracklog" which overhangs the market. It has been estimated that there are 3,994 US oil wells, drilled between January and August 2014, that have since then been idled. Since it is more economical to re-open these wells than to drill new ones, this inventory must be worked through first. The "fracklog" therefore represents another potential source of supply which hangs over the oil Price. Thus far, technology has been able to not only re-open formerly uneconomical conventional wells to fracking, but also to maintain their productive lives. Low interest rates have then been able to sustain them commercially. If the normalization in interest rates from the Fed is as shallow as the market expects, there may be even more life in US shale. 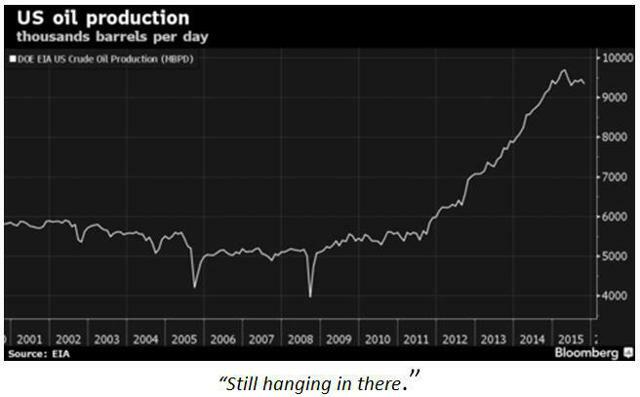 Continued global oversupply of oil, and hence lower prices, look set to remain in place for the foreseeable future. The Fed is thus faced with a disinflationary risk that may also be a consumer tailwind for the economy. With no clear signal on how this all plays out, the Fed must therefore sit on its hands and watch. NORMALLY, when hedge funds shut up shop, it is because the results have been poor. But that is not the case with Martin Taylor of Nevsky Capital who is retiring with an average annual return of 18.4%, some 16 percentage points ahead of the hedge fund average. In his final report (courtesy of Zero Hedge), he says the game is not worth playing; like a batsman who has scored a century, he has tucked his bat under his arm and has headed back to the pavilion, to let someone else have a go. The report is a fascinating read, not just for what he says about markets but for his views on the global economy. The main points are as follows. 1. Investors need good data if they are to make decisions but the rise of China and India has diluted the quality of that data. Currently stated Chinese real GDP growth is 7.1% and India’s is 7.4%. Both are substantially over stated. This obfuscation and distortion of data, whether deliberate or inadvertent, makes it increasingly difficult to forecast macro and hence micro as well, for an ever growing share of our investment universe. Companies are also disclosing less information and this increases the specific risk of investing in individual stocks and bonds. 2. Nationalism is increasing which makes decision-making harder to anticipate and increases the risks for foreign investors, who may be the subject of nationalistic decisions. 3. Markets are less transparent, thanks to the retreat of banks from market-making and the rise of index funds and algorithmic traders. Prices can move rapidly (fat tails), perhaps in response to a trading mistake. This too increases risks. it is more difficult than ever before for us to accurately forecast macroeconomic and corporate variables. This pushes up our cost of capital and substantially increases the risk of us suffering substantial capital loss on individual positions either because of a forecast error or simply because we could be caught up in an erroneous market trend, which could then persist for far longer than we could take the pain. 4. The US economy is likely to suffer from a lower trend growth rate, thanks to a fall in the labour force participation rate (as the baby boomers retire). This means the labour market has tightened rapidly. But the US economy could accelerate in the first half of 2016, thanks to the warm winter, which may force the Fed to tighten more quickly. 5. US companies are not prepared for a rise in the cost of capital. Their sales have been flat, they have squeezed costs as far as possible already and their balance sheets are stretched (Mr Taylor dismisses the aggregate numbers, saying that cash holdings are concentrated in a few tech companies). There are 40% more highly-indebted companies than there were in 2007. US equities are not priced to reflect these risks. 6. Emerging markets are not cheap, despite their falls; their debt has been going up and the return on equity has been going down. So why doesn't Mr Taylor simply act as a bear and short equities? That is because of the risk of a seventh factor. 7. China could decide to solve its problems by using quantitative easing to buy up non-performing loans from the banks. If it does, asset prices could soar. As it is impossible to devise a strategy that can deal with the alternatives of a slow-grinding bear market and a sudden bull surge, it is best to stop. It is a fascinating thesis with a lot to commend it. One can quibble with some of the detail; perhaps the labour market participation rate can rise again, particularly if baby boomers find they don't have enough money with which to retire. Another key point is that it is not just Chinese policies that are hard to read. For the last seven years, central banks in the west have given a clear steer to investors that they are interested in pushing prices up. Philosophically, we have moved a long way from the "you can't buck the markets" philosophy of Margaret Thatcher. Central banks have shown that, with an unlimited chequebook, you can buck the markets for a considerable period. Markets have not been "free" in the classical sense. Now that the Fed is changing tack, it is harder for investors like Mr Taylor to assess the situation, not least because it is hard to know where asset prices would be without central bank intervention. The training wheels have been taken off the bike and it is hardly surprising that many investors won't like the resulting wobbles. WASHINGTON, DC – The recent decline in China’s currency, the renminbi, which has fueled turmoil in Chinese stock markets and drove the government to suspend trading twice last week, highlights a major challenge facing the country: how to balance its domestic and international economic obligations. The approach the authorities take will have a major impact on the wellbeing of the global economy. The 2008 global financial crisis, coupled with the disappointing recovery in the advanced economies that followed, injected a new urgency into China’s efforts to shift its growth model from one based on investment and external demand to one underpinned by domestic consumption. Navigating such a structural transition without causing a sharp decline in economic growth would be difficult for any country. The challenge is even greater for a country as large and complex as China, especially given today’s environment of sluggish global growth. For years, China’s government sought to broaden equity ownership, thereby providing more Chinese citizens with a stake in a successful transition to a market economy. But, like the United States’ effort to expand home ownership in the years preceding the 2008 crisis, Chinese policies went too far, creating a financially unsustainable situation that implied the possibility of major price declines and dislocations. As a result, the adjustment challenge has grown dramatically. With Chinese companies no longer able to sell a rapidly increasing volume of products abroad and support further expansion of productive capacity, the economy has lost some important growth, employment, and wage engines. The resulting economic slowdown has undermined the government’s capacity to maintain inflated asset prices and avoid pockets of credit distress. In an effort to limit the detrimental impact of all this on citizens’ wellbeing, Chinese officials have been guiding the currency lower. A surprise devaluation last August has been followed by a number of lower daily fixes in the onshore exchange rate, all intended to make Chinese goods more attractive abroad, while accelerating import substitution at home. The renminbi has depreciated even more in the offshore market. China’s currency devaluations are consistent with a broader trend among both emerging and advanced economies in recent years. Soon after the global financial crisis, the US relied heavily on expansionary monetary policy, characterized by near-zero interest rates and large-scale asset purchases, which weakened the dollar, thereby boosting exports. More recently, the European Central Bank has adopted a similar approach, guiding the euro downward in an effort to boost domestic activity. But in pursuing its domestic objectives, China risks inadvertently amplifying global financial instability. Specifically, markets worry that renminbi devaluation could “steal” growth from other countries, including those that have far more foreign debt and far less robust financial cushions than China, which maintains ample international reserves. This concern speaks to the even more challenging balancing act that China must perform as it seeks to play the role in global economic governance that its economic weight warrants. After all, China is now the world’s second-largest economy (and, by some non-market measures, the largest). And, indeed, China has lately been showing greater interest in gradually internationalizing its financial system. Notably, it recently succeeded in persuading the International Monetary Fund to add the renminbi to the basket of currencies that determines the value of the Special Drawing Right, the unit the IMF uses in dealing with its 188 member countries. That step – which places the renminbi on par with the major global currencies (the US dollar, the euro, the British pound, and the Japanese yen) – will enhance public- and private-sector acceptance of China’s currency in the international monetary system. At the same time, it created the expectation – though not the obligation – that China will refrain from aggravating global financial instability. 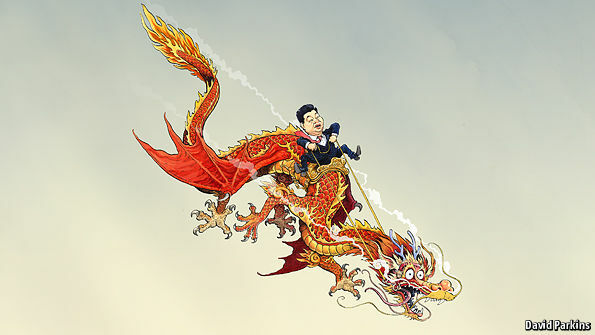 There will come a time when China’s domestic and international responsibilities will again be relatively well aligned. But that time is not now; and, given the country’s tricky ongoing structural transition, it probably will not come anytime soon. In the meantime, it seems likely that China will continue to feel compelled to place its domestic obligations first, but in a nuanced way aimed at avoiding large disruptive tipping points for the global economy. Whether that will be enough to avoid disorderly outcomes, however, is not totally assured. Lacy Hunt at Hoisington Management emailed their 6-page fourth quarter report (not yet posted on the Hoisington Website). As always, the report is well worth a good look. One particular section caught my eye. It's on the failure of QE to produce the expected growth. Here are a few excerpts. In a paper presented at the Fed's 2013 Jackson Hole Conference, Robert Hall of Stanford University and Chair of the National Bureau of Economic Research Cycle Dating Committee wrote "an expansion of reserves contracts the economy." This empirical data [the Jackson Hole presentation] notwithstanding, a causal explanation of why QE and forward guidance should have had negative consequences was lacking. This void has now been addressed by "Where Did the Growth Go?" by Michael Spence (2001 recipient of the Nobel Prize in economics) and Kevin M. Warsh (former Governor of the Federal Reserve), a chapter in a new book Growing Global: Lessons for the New Enterprise, published in November 2015 by The Center for Global Enterprise. Their line of reasoning is that the adverse impact of monetary policy on economic growth resulted from the impact on business investment in plant and equipment. In particular, they state: "We believe the novel, long-term use of extraordinary monetary policy systematically biases decision-makers toward financial assets and away from real assets." First, financial assets can be short-lived, in the sense that share buybacks and other financial transactions can be curtailed easily and at any time. CEOs cannot be certain about the consequences of unwinding QE on the real economy. The resulting risk aversion translates to a preference for shorter-term commitments, such as financial assets. Second, financial assets are more liquid. In a financial crisis, capital equipment and other real assets are extremely illiquid. Financial assets can be sold if survivability is at stake, and as is often said, "illiquidity can be fatal." Third, QE "in effect if not by design" reduces volatility of financial markets but not the volatility of real asset prices. Like 2007, actual macro risk may be the highest when market measures of volatility are the lowest. "Thus financial assets tend to outperform real assets because market volatility is lower than real economic volatility." Fourth, QE works by a "signaling effect" rather than by any actual policy operations. Event studies show QE is viewed positively, while the removal of QE is viewed negatively. Thus, market participants believe QE puts a floor under financial asset prices. According to a Spence and Warsh op-ed article in the Wall Street Journal (Oct. 26, 2015), "... only about half of the profit improvement in the current period is from business operation; the balance of earnings-per-share gains arose from record levels of share buybacks. So the quality of earnings is as deficient as its quantity." It is certainly not news in this corner that QE has been counterproductive, but I have never seen a better explanation as to precisely why than the above excerpts. Digging a little further, and following the op-ed reference above, I located the Wall Street Journal commentary The Fed Has Hurt Business Investment by Michael Spense and Kevin Warsh. On his recent book tour, former Federal Reserve Chairman Ben Bernanke stated that low long-term interest rates are not the Fed's doing. Low rates result from a shortage of good capital projects. If there were good investment projects, he explained, capital would flow and interest rates would rise. Mr. Bernanke insists that the absence of compelling investment opportunities in the real economy justifies continued, highly accommodative monetary policy. That may well be true according to economic textbooks. But textbooks presume the normal conduct of policy and that the prices of financial assets like stocks and bonds are broadly consistent with expectations for the real economy. Nothing could be further from the truth in the current recovery. During the past five years earnings of the S&P 500 have grown about 6.9% annually. As the table nearby shows the current profit picture pales in comparison to prior economic expansions, in which earnings grew significantly faster. Moreover, only about half of the profit improvement in the current period is from business operations; the balance of earnings-per-share gains arose from record levels of share buybacks. So the quality of earnings is as deficient as its quantity. The current economic expansion is also unusual because the stock market and other financial assets have boomed in spite of relatively muted profit gains. What explains the apparent divergence between earnings and asset prices? The unusual conduct of monetary policy. In a follow-up Wall Street Journal opinion piece Michael Spense and Kevin Warsh take on Larry Summers in A Little Humility, Please, Mr. Summers. In a recent op-ed for this newspaper, we proffered an explanation for a phenomenon that most macroeconomic models cannot adequately explain: Why is investment in U.S. financial assets so strong and investment in the real economy so modest? Former U.S. Treasury secretary and Harvard president Larry Summers took issue with our views on his blog. He was one of the principal architects of the U.S. government's fiscal and regulatory response, and is among the foremost defenders of the recent conduct of monetary policy. So, Mr. Summers is understandably a fierce defender of the current regime. But his breathless defense of the consequences of extraordinary monetary policy reveals a troubling immodesty. We would suggest more humility in considering the full consequences that may arise from the new tools and tendencies in the conduct of monetary policy. First, Mr. Summers mischaracterizes what he calls the "Spence-Warsh doctrine." He sets out the straw man for his censure, stating Spence and Warsh believe "overly easy monetary policy reduces business investment." This is an interesting proposition, but it does not happen to be the one we make. Instead, we posit something quite different: "QE [quantitative easing] has redirected capital from the real domestic economy to financial assets." By conflating low interest-rate policy with the use of QE, Mr. Summers apparently believes that these policy tools are similar in application and effect. We disagree. We believe that QE is fundamentally different in kind than standard-issue low rate policy. And QE, we argue, appears to work through different transmission mechanisms than the standard conduct of monetary policy. Event studies in the U.S. and abroad suggest that QE appears to have far great effect through the asset price channel than the lending, credit and confidence channels. As a result, risk assets like stocks respond to QE more robustly than does the real side of the economy. Spence and Warsh go on with three other points disputing nonsense by Larry Summers. It's a welcome breath of fresh air that I previously missed. Here is a chart from the article. Summers, Bernanke, Yellen and their ilk ought to explain former Dallas Fed Richard Fisher confession on Squawk Box "We Frontloaded a Tremendous Market Rally". In his confession, Fisher admits "We frontloaded a tremendous market rally to create a wealth effect ... The Federal Reserve is a giant weapon that has no ammunition left." The alleged "wealth effect" is an illusion. It will vanish, with severe consequences, either in the next big downturn, or via a long drawn out process like Japan. Ben Bernanke stated "In theory, QE does not work, in practice it does." Bernanke, like summers is wrong. If anyone in this world needs a dose of humility, it's Bernanke and his "we saved the world" nonsense. The Fed is largely responsible for the Dotcom bubble, the housing bubble, and the current bubble (none of which they have seen in advance), and none of which they have admitted any responsibility over. I predict Janet Yellen will resign as Fed chair for health reasons. Summers is so damn arrogant and so damn wrong that he must be considered the front-runner to replace Yellen. Greenspan, Bernanke, and Yellen have pushed the global economy to the edge of a cliff. It would be fitting in a sense, if Summers, carrying out the exact same policies, pushes us over the edge. Regular contributor Michael Pollaro offers three more charts which tell a story that's both disturbing and apparently misunderstood by a lot of mainstream analysts. The US trade deficit (exports minus imports) has been getting smaller. Since a trade deficit subtracts from GDP growth, a shrinking deficit will, other things being equal, produce a bigger, faster-growing economy (that's the mainstream take). But other things aren't equal. It turns out that the components of that trade balance figure are both shrinking. Exports -- the stuff we sell to foreigners -- have been declining since the dollar spiked in 2014. That's not a surprise, since a strengthening currency makes exports more expensive and thus harder to sell. So other countries are buying less of our stuff, which though not surprising is a bad sign. Meanwhile, imports -- stuff we buy from abroad -- have also plunged in the past year, which is partly due to cheaper oil lowering the dollar value of energy and other commodity imports. But it also means that even though French wine and German cars have become less expensive as the dollar has soared against the euro, we're not buying more of them. So US consumers, even with all the money they're saving at the gas pump, still can't (or won't) take advantage of a sale on imported goods. If imports and exports are both falling, that means consumption is weak pretty much everywhere. And weak consumption means slow or negative growth, which contradicts the recovery thesis that now dominates policy making and the financial media. It also makes last week's market turmoil easier to understand. Falling trade means lower corporate profits, which, if history is still a valid guide, means less valuable equities. So it could be that the markets are simply figuring this out and revaluing assets accordingly.